BILLERICA, Massachusetts, April 17, 2018 ─ Bruker today announced that it has acquired Anasys Instruments Corp., a privately held company that develops and manufactures nanoscale infrared spectroscopy and thermal measurement instruments. This acquisition adds to Bruker’s portfolio of Raman and FTIR spectrometers, as well as to its nanoscale surface science instruments, such as atomic force microscopy and white-light interferometric 3D microscopy. Financial details of the transaction were not disclosed. Anasys Instruments is the world leader in photothermal IR spectroscopy from the nanoscale to the sub-micron and macro scales. We are dedicated to delivering innovative products and solutions that measure spatially varying physical and chemical properties with nanoscale spatial resolution in a diverse range of fields, including polymers, 2D materials, materials science, life science and micro-electronics industry. Our goal is to provide productive solutions that help researchers clear the path to their next discovery and help industrial companies to solve critical process problems. 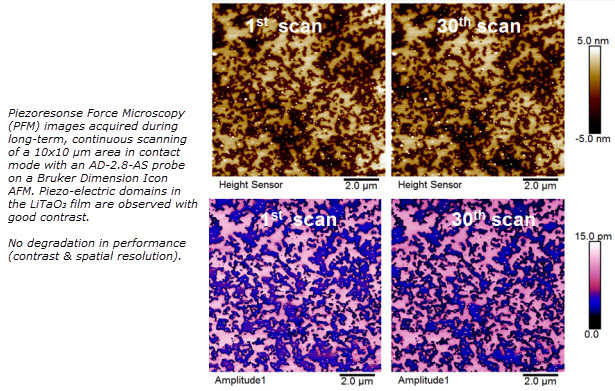 Optimized probes for lowest forces in BioAFM imaging and force spectroscopy. The added drift compensation on MLCT-BIO-DC enables maintaining low, constant forces in both, contact mode imaging and ramp-hold experiments where force drift often effectively limits the ability to probe cell viscoelasticity. Introducing Bruker’s line of individually precalibrated probes for quantitative nanomechanical mapping with Dimension Icon. These probes address the dominant sources of errors in nanomechanics mapping by providing a controlled 30nm end radius and individually LDV (Laser Dopper Vibrometer) calibrated spring constants. 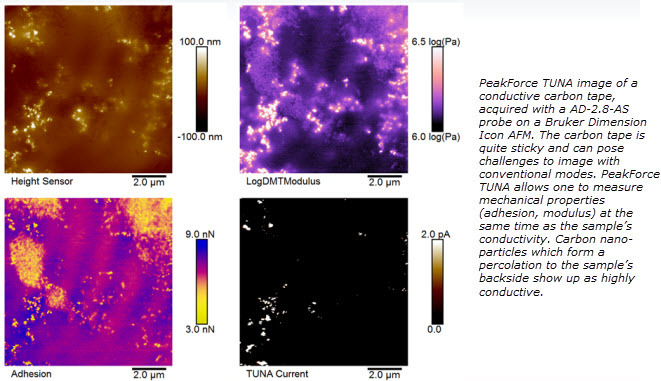 Individual probe parameters are embedded in a QR code for fast and error free transfer into Bruker v9.4 NanoScope real-time software with the QR reader included in the new Bruker PeakForce QNM high accuracy kits.